RANGPUR, May 27, 2018 (BSS)- The litchi business is going on strong in all five districts under Rangpur agriculture region where harvesting of the most popular, fleshy and juicy seasonal fruit begins in full swing, officials and market sources said. As the business picks up, hundreds of labourers are now becoming engaged in harvesting and marketing of litchi in Rangpur, Gaibandha, Kurigram, Lalmonirhat and Nilphamari districts under the region. "Because of favourable climatic condition, the farmers are getting bumper production of comparatively big-sized litchi this season," Khondker Md Mesbahul Islam, Horticulture Specialist of the Department of Agriculture Extension (DAE) at its regional office here told BSS today. "The farmers have cultivated litchi on 1,650 hectares of land and the production might cross 15,000 tonnes worth Taka 150 crore this year as the tender fruits grew superbly following frequent rainfalls since last April in the region," Islam said. He said harvest of the 'Bombay', 'Mozaffarpuri', 'Madrazi' and 'China-2' variety litchi continues in full swing with plenty of supply and better market price making both the growers and traders happy this season. The 'Bombay', 'Mozaffarpuri', and 'Madrazi' varieties of litchi are being sold at rates between Taka 180 and 200 for every 100 pieces while 'China-2' variety at Taka 300 to 350 for every 100 pieces in the local markets. "However, harvest of the aristocrat litchi varieties like 'Bedana', 'Kanthali' and 'China-3' will begin from first week of June next and the price for every 100 pieces of these litchi varieties might remain between Taka 500 and 700," Islam added. Fruit traders Babu Mian and Fazlur Rahman at Rangpur City Bazar said supply of litchi remains plenty in the local markets following bumper production even after trading huge quantity of the fruit daily from the region to the capital city and other areas. 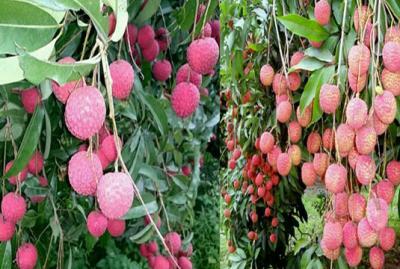 Like in the previous years, litchi traders from Dhaka, Munshiganj, Tangail and other places have already purchased the growing litchi in the trees in most of the orchards with 'China-3' and 'Bedana' variety litchi to start marketing those from the next month. Litchi orchard owners Apel Mian of Moulaviganj village under Gangachara upazila and Atiar Rahman of Deodoba Baro Maidan village under Sadar upazila in Rangpur expected bumper output of aristocrat variety 'Bedana' and 'China- 3' litchi this season. Deputy Director of the DAE at its regional office Md Moniruzzaman said many labourers are engaged in harvesting, processing and marketing of litchi to earn better wages in the region. "Litchi farming on commercial basis has already become a profitable venture bringing a silent economic revolution and self-reliance to many of the farmers in recent years in all five districts of Rangpur agriculture region," Moniruzzaman added.